Stockport Pick 'n' Mix was an end of season tournament weekend, mostly FoG and DBMM. It ran as two separate one dayers over the Saturday and Sunday - I was able to call in on the Sunday (and give my Feudal Aragonese a pre-Christmas outing). For FoG, the format was 650 points on a 5' x 3' table (with one less terrain piece) for 3 150 minute games. We fought for army prizes and raffled extras as well as for the boxes of sweets. It worked very well, I thought. Unfortunately, my three 'open' games produced nothing 'in' period. 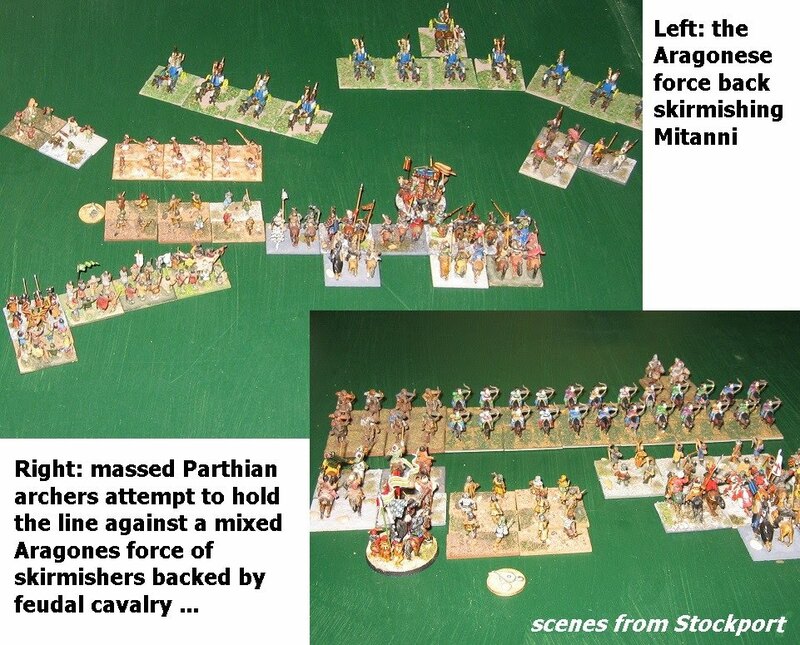 Nevertheless, a game against Hammy's Mitanni, a junior with Parthians and a Roman swarm provided some entertaining and informative distractions. I've largely steered clear of Biblical period FoG, as the treatment of Chariots has looked a bit questionable (back to the old discredited 'Panzer Division' theory, I had thought) ... In play, they are better than I expected, although I would like to see them skirmish in deeper formations. They ought to be a little harder for missile foot to hit ... That, of course, is the good news. Sadly, against a 'free-style' player like me, that means Umpire interventions and explanations every other move. 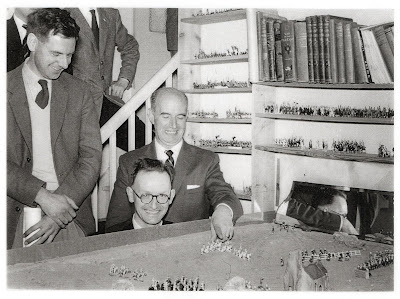 I'm not making these comments as a grumpy wargamer ... 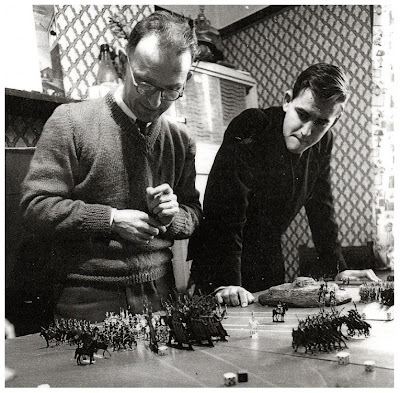 Win or lose, the swarm style game is dire as a historical wargame (it might be more satisfying to those who like the game as a sort of geometric chess that has no link to ancient warfare) ..
More I would draw attention to the fact that overall, because it produces such a nit-picky, niggardly game, it is a bad choice for a fast play format. 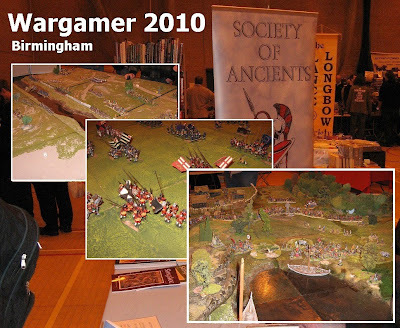 Second would be to state again that I prefer pre-set terrain (I have never yet seen a game improved by player chosen terrain - not in 20 years of it): more so now that FoG has re-introduced the tedious terrain system that the BHGS imposed on reluctant DBM players back in the 1990s. The BHGS/FoG system still produces implausible and unplayable tables in equal measure, and panders to the gamier fringe. Still, I suffered a limited loss against the Romans (bounced off a couple of frontal melees with damage, then got my Light Horse caught by one of those 'cleverly' angled charges that obliges them to evade in a direction that ignores the obvious and wide open safe area) ... not enough to spoil a good day's wargaming. I hope this will become a regular event. 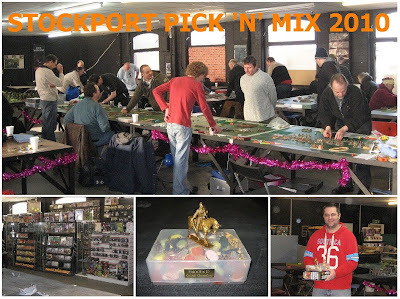 The North West Regional Gaming centre, Hallam Mill, Stockport is a great venue, with good facilities and cheerful staff ... 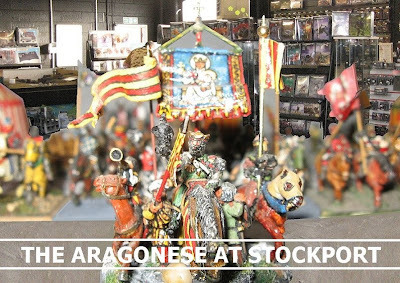 Very 'Warhammer' as these places always are, but with a good stock of ancient and medieval plastics, if you are passing by. I managed to recruit a new member to the Society of Ancients while I was there, and distribute a few sample issues of Slingshot - so a fitting last outing for the Shows North roadshow. I have still a couple of posts I intend to fit in this year ... but these will now be from winter quarters. We will see you in the New Year. Quite possibly at Penarth in support of the new Society of Ancients UK DBA League ... and we will be at York Racecourse for Vapnartak. *with an army famed for its relentlessly frontal fighting - but that's FoG drilled MF for you! Slightly more on our doorstep, Wargamer was never really in doubt. 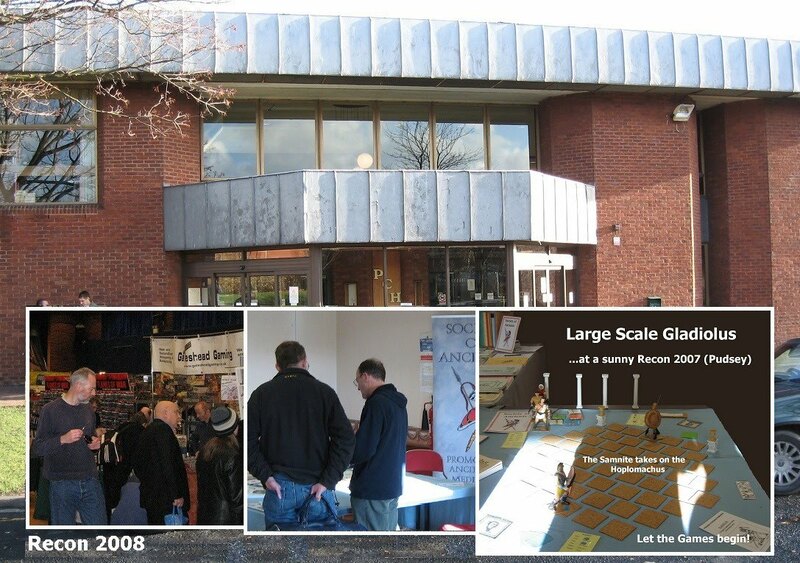 A modest show but one which attracts a fair smattering of Midlands traders and often quite a good selection of games. For the Society of Ancients, this would be the last outing of the year for 'Greyhounds in the Slips'. I had tried to see if I could set up a few Championship games (I am ever eager to fly the flag), but there was little support locally. Must be the weather. 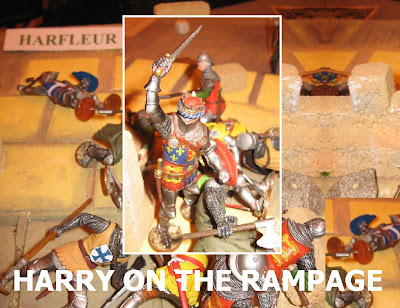 We had the full range of results at Harfleur, including the one where nearly all the English were taken out by the sniping crossbowman, and the one where Harry hacked his way through almost the entire French detachment single handed. On balance, of course, the English took the breach - but not without a few rousing speeches to stiffen the sinews. Elsewhere, there were a couple of excellent ancients games, a Romans in Britain game from the Border Warlords, which, on closer enquiry, turned out to be being played with WRG 6th Edition. 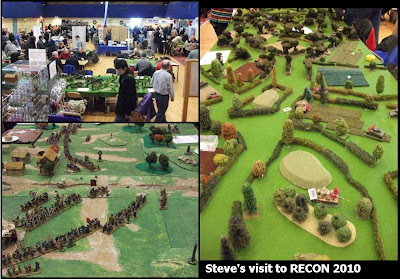 Amongst the other interesting fare, there was a lot of WW2 (not all FOW), an attractive Napoleonic skirmish, and a couple of good looking ECW games. There are a few bonus pictures of the English Civil War stuff here on my ECW blog. Many apologies to the organisers - as advised, we were unable to travel to Recon due to uncertainties over the severe weather. As it happens, it seems it would have been fine (but how can you tell at 6.30am in freezing conditions?). There were no particular problems and the local main roads and the motorways were clear (though there were a couple of snow ploughs on the other carriageway of the M62 over the Pennines clearing the margins of the road). The Pudsey Civic Centre car park was covered with snow and had not been gritted but was negotiable with care. As promised on the web the previous evening, the show went on though (not surprisingly) in somewhat reduced form. Many traders and games had failed to make it and the show was confined to the main hall (nothing upstairs). Even so there were several empty tables (rather ironic that originally there wasn't room for an L&LS game of Wakefield 1460). A Dark Ages game was using the free "Comitatus" rules. 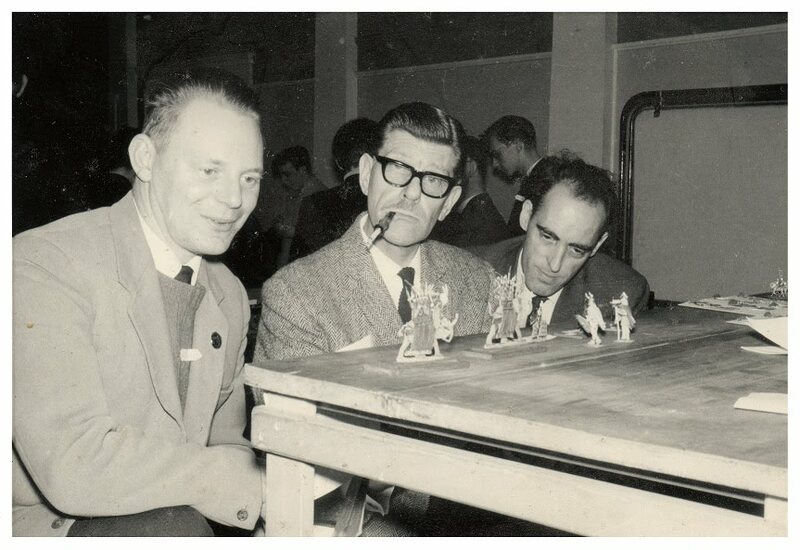 There were a few other small games, mainly fantasy but nothing particularly eye-catching. Despite the weather difficulties about 250 wargamers (as well as me) made it through the doors, so well done to them and the organisers. Here's a memory of us at Recon in 2008 (it was snowy then, too ...). We did Gladiolus with the big Gladiators.